"Astana Pro Team is sorry for the error, and apologizes to the peloton and race organizers for the harm these televised images caused to professional cycling." After Vincenzo Nibali was disqualified from the Vuelta a Espana for holding onto a team car, Astana have issued a statement to apologize for the incident. "Astana Pro Team riders Paolo Tiralongo, Fabio Aru, Vincenzo Nibali and Diego Rosa crashed on Sunday during the live television broadcast of the second stage of the Vuelta a España," they wrote. "Tiralongo fell on his left cheek and temple and received first aid from the race doctor immediately after the crash and later more than 20 stitches to sew up his face. Rosa, Aru and Nibali all received superficial skin abrasions to their upper and lower legs. "All totaled more than two dozen riders in the peloton also crashed heavily at more than 60kph with around 30km remaining in the stage. 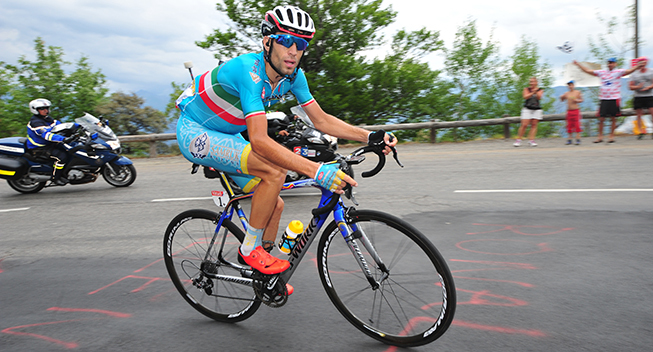 Aru, Nibali and Tiralongo all exchanged their bicycles after the crash and began chasing to catch the speeding peloton. "Nibali called for a replacement water bottle and was filmed by television cameras in a race helicopter as Astana Pro Team Director Sportif Alexander Sheffer towed him for more than five seconds to rejoin the chasing group with around 20km to the finish. Nibali rejoined the main peloton with 10km to go. "For this illegal assistance, race jury officials took the unusual and severe step to expel Nibali and Sheffer from the Vuelta a España and to remove the team's second vehicle from competition for two days. "Astana Pro Team is sorry for the error, and apologizes to the peloton and race organizers for the harm these televised images caused to professional cycling. "Aru and Rosa will start stage three, Tiralongo is scheduled to start and will undergo more medical checks to his injuries before resuming the Vuelta a España."